Whether grown in a garden, a barrel, old tires or a grow bag, potatoes need to be covered with loose organic material periodically, or hilled up. This addition of organic material encourages the potato tubers to grow deep and wide and allows new potatoes to form on top of maturing potatoes. Depth and darkness improve the flavor of potatoes. Potatoes grown too close to the surface and receiving too much sunlight will grow bitter and contain chemicals that can be toxic. Traditionally, in March-May seed potatoes are planted 1 ½-2 feet apart in a 6- to 8-inch deep trench. 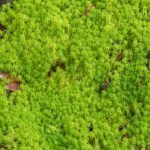 They are covered with soil or organic material, such as sphagnum peat moss, mulch or straw and then watered deeply. In early spring, Mother Nature may do much of the watering. When the potato vines grow to about 6-8 inches above the soil surface, more soil or organic material is hilled up around the young potato seedlings so that only the top leaves stick out of the ground. This forces new tubers and new potatoes to grow under the new mound of soil. When the potato vines again reach 6-8 inches above the soil surface, they are hilled up again. If there is the danger of a late frost, young tender potato plants can be completely covered with this soil to protect them from frost damage. 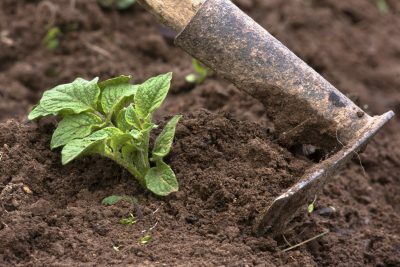 Hilling up potatoes also helps keep weeds down around the potato root zone, so the potatoes are not competing for nutrients. Covering potato plants with fresh, rich loose organic material like this can continue until the hill is as tall as you can or want to make it. Ideally, the taller the hill, the more potatoes you will get. Unfortunately, rain and wind can erode these potato hills if they are left exposed. Some farmers use bricks or wire mesh as walls to hold up the hills and prevent erosion. Many potato growers have come up with new methods of growing deep, erosion free potato hills. One method is to grow potatoes in old tires. A tire is placed in the garden and filled with loose organic material, and a seed potato is planted in the center. When the potato sprouts to about 6-8 inches tall, another tire is stacked on top of the first tire and filled with soil or organic material so that the potato vine is vertical and its top leaves are just sticking out of the soil surface or just below the soil surface. As the potatoes grow, more tires and soil are added until your tire pillar is as high as you want to go. Then when it is time to harvest potatoes, the tires are simply removed, one by one, exposing the potatoes for harvest. Many people swear this is the best way to grow potatoes, while others continued to try other methods. Other ways to grow deep, flavorful potatoes is in a barrel, garbage bin or grow bag. Make sure barrels or garbage bins have proper drainage holes in the bottom before planting. Proper drainage is essential to successful potato growing, as too much water can cause tubers and potatoes to rot. Potatoes grown in barrels, bins or grow bags are grown the same way as they are grown in natural hills or tires. The seed potato is planted in the bottom in a layer of loose soil about a foot deep. When the potato vine grows to about 6-8 inches, more soil is gently added to cover all but the tips of the potato plant. Potato vines are allowed to grow a little, then covered with loose soil or organic material this way until you reach the top of your barrel or grow bag. Wherever you choose to grow your potatoes, covering potato plants with loose organic material is essential for proper potato development. With any method, potato plants are hilled up or covered whenever the potato vine reaches about 6-8 inches tall. Some potato growers like to add a thin layer of straw between each addition of soil. However you grow your potatoes, deep watering, proper drainage and hilling up with fresh soil are the keys to healthy, flavorful potatoes.